Frequently voted as the UK’s most romantic destination, The Lake District, Cumbria is renowned for its wild and emotive scenery, providing the perfect place to spend Valentine’s Day or a romantic break away any time of year. Choose from luxurious hotels with state of the art spas to centrally located city chic apartments or remote retreats tucked away to relax, unwind, and enjoy some extra special time together. Fulton’s Lakes Jewellery Works (Keswick): Choose the most important diamond of your life at Cumbria’s first Jewellery Works – If you are looking for a diamond ring in time to pop the question this Valentine’s Day, then look no further than Fulton’s Lakes Jewellery Works, who opened its doors in October 2017 and is looking forward to their first Valentines season and welcome customers to not only buy a ring of their dreams – but to help design it, see how it is made and meet the skilled craftsman behind the scenes himself – Brain Fulton. The brand-new attraction is headed up by husband and wife team Brian and Zoe Fulton. Brian has been designing, making and selling exquisite bespoke jewellery to both the trade and public for 35 years since his training began at Openshaw College in Manchester. magnificent award winning 11-bedroom Country House Hotel situated in the unspoilt Borrowdale Valley, just four miles South of Keswick is set amongst three acres of private grounds and is surrounded by stunning scenery and meandering rivers. This February enjoy a two-night Valentines break including a 7 course tasting menu by award winning Head Chef Noel Breaks – with matching wines whilst listening to beautiful harp music. Valentine’s breaks start from £500 for 2 nights from the 16 to 18 February. 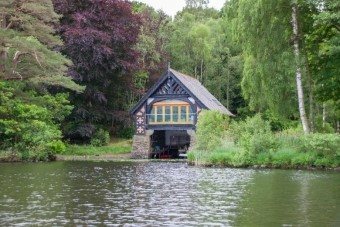 The Boathouse, Pullwood (from Heart of the Lakes): For a romantic room with a view – There can be few more idyllic locations in the Lake District than this stunning boathouse right on the shores of Lake Windermere in the heart of the Pullwood Bay Estate. Built in the 19thC this charming detached boathouse was once used by the owners of the original mansion house, now it has been beautifully renovated with all modern facilities and everything you need for a unique break away. Perfect for that special occasion or even just for a treat – this is truly a place to relax, unwind and take in the beautiful surroundings. If you are looking to get away to somewhere truly special this Valentines, then we are sure you will love The Boathouse. The Wordsworth Hotel & Spa (Grasmere): Nestled in the enchanting village of Grasmere and surrounded by some of the region’s most iconic scenery this hotel is simply made for romance with all the necessary elements to celebrate the most romantic time of the year. Stay in a luxurious superior room where you’ll find a chilled bottle of Champagne and locally handmade chocolates waiting on your arrival. Head out for a walk taking in some of England’s finest scenery before enjoying a phenomenal 4 course dinner with canapes in the award-winning Signature Restaurant. A Bucks Fizz breakfast will be delivered to your bedroom the following morning making it the perfect start to the day. Valentine’s breaks start from £229 Sundays to Thursday and £249 Saturdays and Sundays. Askham Hall (Askham): A rural retreat fit for royalty – Dating back to the late 1200s, this Grade I listed hideaway was previously home to the Earls of Lonsdale and has open roaring fires, comfy sofas and intimate areas to create a warm, relaxing and luxurious feel. Couples can stroll hand-in-hand in the 12 acre gardens and enjoy a candlelit meal in the award-winning restaurant – menus are prepared using an abundance of fresh produce from the hall’s extensive kitchen garden, vegetable gardens and orchards. Room rates start from £150 per night for 2, including breakfast. The Belsfield, Laura Ashley Hotel – Overlooking England’s longest lake and with beautiful Laura Ashley interiors The Belsfield oozes romance inside and out and with flowers, chocolates and fizz ready in the room on arrival the fuss is taken away and couples can encapsulate themselves in each other’s company. With perfectly designed bedrooms, lake-view restaurant and idyllic gardens The Belsfield has romance in the Lake District to a tee. Valentines Weekend Packages start from £237 per night or for Valentine’s Day itself from £299 per night, but on a dinner, bed and breakfast basis. The Lodges at Artlegarth – In the peaceful Yorkshire Dales, Artlegarth’s brand-new log cabins are perfectly designed and styled to provide modern and original valentines get away. Each with their own private hot-tub and a concealed cocktail bar the three lodges also have extensive glazing to ensure the spectacular views, of open countryside and fells, can be enjoyed inside as well as out, with a log burning stove to snuggle up in front of too. Guests can also choose for a range of exclusive extras including fresh flowers, hampers of local and artisan foods and spa and beauty treatments to be enjoyed from the privacy of the lodge. The Halston – Experience the best of a serviced hotel with the privacy of your own apartment at The Halston Aparthotel in Carlisle. Cumbria’s only five-star apartments are the perfect city/country get away this valentine’s day. Only a short distance from the Lake District and from Hadrian’s Wall World Heritage Sites whilst having original bars and restaurants within walking distance The Halston offers the best of both worlds. The Ultimate Romance overnight stay for two in a one bedroom luxury apartment, complete with a pair of mini Bottega bottles and rose petals is £225, including a 3 course set menu for both in brand-new tapas and lounge bar Penny Blue, and breakfast in Bartons Yard. The Cottage in the Wood – Cottage in the Wood is a 17th century restaurant and inn located in the heart of Whinlatter Forest and provides a secluded get-away for the foodies. The three AA Rosette, Inspectors Choice, restaurant provides breath-taking views of the mighty Skiddaw mountain range and the surrounding forest and offers a daily changing menu using local and seasonal ingredients. With Bassenthwaite, Derwentwater, Buttermere, and Crummock Water all near-by ‘The Cottage’ provides a tranquil and relaxing ambience and is the perfect base for exploring the magic of the Lakes.